A couple of months ago I turned 62 and as I cast my fly into the calm margin of a favourite dam called “Wordsworth Water” I recollected on one of my very earliest memories. In fact my memory before this event is almost a void so I guess I was about 4 or 5 years of age. Malcolm’s Uncle Brian had taken him and me fishing That day determined so very much of my later life. I caught a small freshwater fish by the name of “Perch”. Looking back I can still recall the exact fishing spot where I stood. The pond in which the 3 inch fish surrendered its life was no more than 40 metres wide and less than half that across. The fish was caught on a worm. I can plainly see the bars running across its body, I can feel its spiky dorsal fin pricking my hand and I remember distinctly that it had swallowed the worm and hook. 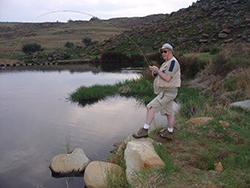 Most of all I remember my happiness on that evening … and, later, the fishing adventures that Malcolm and I shared over the following 24 years until we drifted apart … I moved to South Africa which became my home. My days as a boy and young teenager and early adult were almost all fishing days. Malcolm* and I fished in the rain, the dark, the sun and the wind. We just fished … for the love of it. And, speaking for myself, I still love it and I’ve been fortunate that I’ve learned from fishermen far better than me. Fly fishing for trout did not come quickly nor did it come easily to me but, once it did, it stayed with me and became my past-time of choice. It’s quite simple really … I watch people around me struggle to cast a fly, to catch a trout. I see them beat the water for hours on end and I mean literally beat the water. I see that they are missing so much. And I can see this from 100 metres away. And I know it has nothing to do with the amount of money spent on a rod, a reel or line … it is about a lack of knowledge and understanding of a fish’s behaviour. It’s about not understanding the “thoughts” of a fish as it attempts to live its life in a most dangerous of worlds … the river, lake, dam or pond. 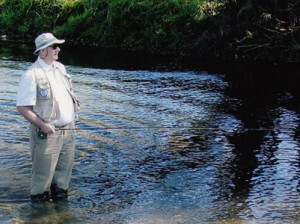 I am somewhat biased towards fishing for trout with a dry fly or nymph using a floating line … The reason is equally simple … it’s how I like to fish best no matter what type of water or condition. Why? Because I enjoy it most this way. It gives me the greatest level of satisfaction. 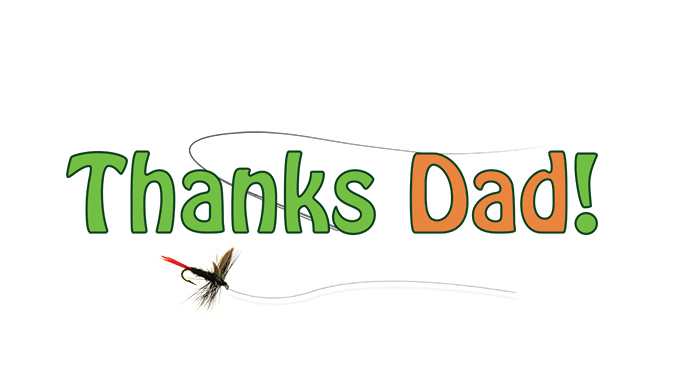 That’s what fly fishing is truly about … enjoyment and personal satisfaction. Ready to go? Then ‘tight lines”. * Malcolm was my best friend … his name: Malcolm Golding. We lived in Lancashire, England. In a small town called Hindley in fact. We were born a week apart, went to the same school and were passionate about fishing. We traveled far and wide by foot, bus, train and in later years by Lambretta Scooter and even by car. We mainly caught Bream, Perch, Roach, Rudd, Tench, Carp, Pike, Chub, Dace, Eels and Gudgeon together over the years. Thanks for everything Dad, your son, Gareth.